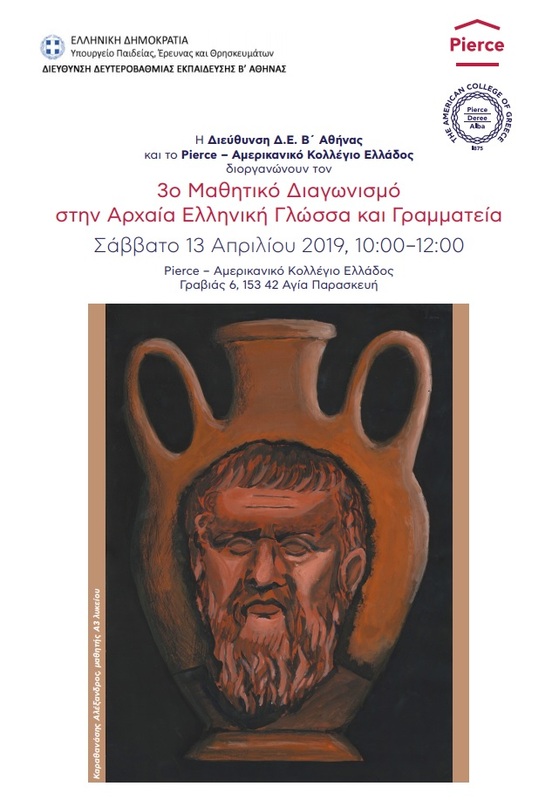 The Directorate of Secondary Education for B Athens and Pierce – The American College of Greece have announced the 3rd Student Competition in the Ancient Greek Language and Literature. The aim of the Competition is to enhance the study of the Ancient Greek Language and Literature by students and to introduce them to more works in Ancient Greek so that they comprehend the timelessness of its concepts and values and to realize that Modern Greek has its roots in Ancient Greek and is its evolution and continuation. In addition, students will understand that the intellectual creation of the Ancient Greeks is inextricably linked to Modern Greek culture and that it contributed to the foundation of Europe and, more generally, Western civilization. The Competition is addressed to students in the first class of General Lyceums, public and private, within the Directorate of Secondary Education for B Athens and will take place on Saturday, April 13 (10:00 – 12:00) at Pierce. Participation is optional and parental consent is required. There is no fee for students who participate.